Mission: The Missouri Citizens' Commission on Compensation for Elected Officials ensures that the power to control the rate of compensation of elected officials is retained and exercised by the tax paying citizens of the state. No elected state official, general assembly member, or judge, except municipal judges, shall receive compensation for the performance of their duties other than in the amount established for each office by the commission. 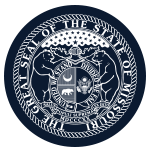 Function: The Missouri Citizens' Commission on Compensation for Elected Officials sets the compensation of state officials, general assembly members and judges. Member Requirements: 1 member must have experience in the field of personnel management, 1 must represent organized labor; 1 must represent small business in the state, 1 must be the chief executive officer of a business doing an average gross annual business in excess of one million dollars; 1 must represent the health care industry; 1 must represent agriculture; and 2 must be over the age of 60 years; 2 public members appointed by the Governor must be citizens of a third class county north of the Missouri River, 2 must be citizens of a third class county south of the Missouri River; 1 member from each congressional district must be selected at random by the Secretary of State; 1 member must be a retired judge appointed by the judges of the Supreme Court. No state official, no member of the general assembly, no active judge of any court, no employee of the state or any of its institutions, boards, commissions, agencies or other entities, no elected or appointed official or employee of any political subdivision of the state, and no lobbyist as defined by law shall serve as a member of the commission. No parent, spouse, child, or dependent relative of any person ineligible for service on the commission may serve on the commission.